After the war, Captain Robert Board became the partner of I. D. Newsome. They opened and operated a successful general merchandising store in McKinney and were the first to buy cotton locally. (3) On April 25, 1866, he married Mrs. Newsome’s sister, Adelia E. Willingham, and, in time, became they became the parents of three children, Edgar, Forest, and Hallie. All three children grew up in the house on 507 N. Bradley St.(4) In keeping with Captain Robert M. Board’s interesting life, in 1923, according to the McKinney Democrat, Capt. Board was the oldest Mason in McKinney. He was made a Mason shortly after he was 21 years old and helped organize the Royal Arch Masons in McKinney. He was, also, one of the early postmasters of McKinney. 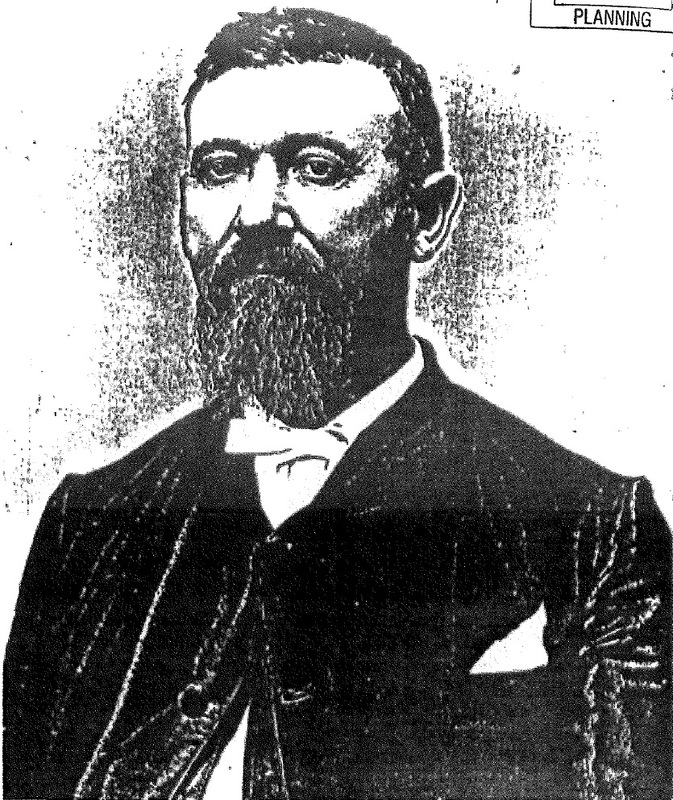 (5) Captain Robert Milton Board was truly one of McKinney’s most notable citizens. By helping to establish McKinney, he also contributed to the establishment our great state of Texas. According to the 1900 U.S. Federal Census, all of the Boards and Hallie’s husband, Thomas Everett, lived on N. Bradley St, thus, the name “The Board-Everett House”(6) Thomas Everett and Hallie Board Everett eventually built a house of their own on Tucker Street. 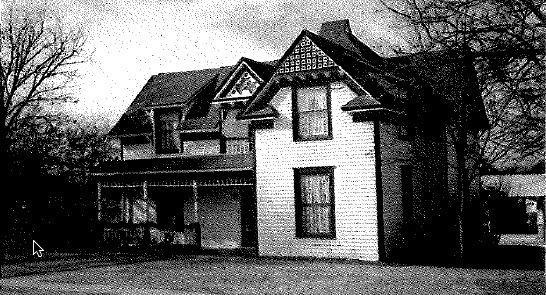 Mr. and Mrs. Charles Hewitt purchased the home on September 8, 1980. They spent several years restoring the Board Everett home to its former glory. The McKinney Courier Gazette wrote,” The house stands as one of the city’s prime examples of an “L” plan dwelling. The small inset balcony above the front entrance is a distinctive element of the structure. The “L” plan is one of the most vernacular house forms in McKinney, and this house is one of the best preserved. (12) The Board-Everett house has been recognized for its excellent restoration in newspapers of the area and was featured in the Heritage Guild’s Christmas Tour of Historical Homes. The home was awarded a national register marker for inclusion in the National Register of Historic Places in 1987. (13) Mrs. Hewitt,, being an artist, left her mark on the home. There are examples of tole painting on a footed tub and on the moldings upstairs. There is also a sketch on the ceiling of the dining room left unfinished. They added porches to the west and southwest areas of the house, and the previous sun porch on the south side of the home was turned into a den. When Susan and Terry Gennann purchased the house on November 1, 2000, they continued the updates to the Board-Everett home. The kitchen was renovated with a Viking oven, and granite countertops. New cabinets were added to the kitchen, as well, to help modernize the home a bit and make it more livable. Susan totally repainted the interior and had the exterior painted, also. The Germanns added a guest bathroom downstairs and a master bedroom with and en-suite upstairs. In June 2012, the lovely Victorian home was purchased by Jon and Susan Gastrock. Within the past year, the Gastrocks have added a white picket fence to the front and side yard, removed the old wooden privacy fence, and added a two-car garage that matches the home beautifully. The next project will be to landscape the yard area between the home and the garage. Jon has also repaired and repainted the original front porch screen door, and he has placed it back on the front entrance. Although, the home has been upgraded and modified through the years to accommodate a more modem lifestyle, the structure still looks much as it did 125 years ago. We will continue to preserve and care for this lovely Victorian structure. It is our job to try and preserve as much of the historic dignity of the Board-Everett home, as possible. We are truly honored to be the newest caretakers of this beautiful Victorian home. 1. United States of America. State of Texas. Texas General Land Office, Austin, TX. Abstracts ofAll Original Texas Land Titles Comprising Grants & Locations. Print. 2. Rickards, Herbert. “Capt. Robert Milton Board.” Capt. Robert Milton Board (1837- 1931)-Find a Grave Memorial. Herbert Rickards, 01 June 2002. Web. 23 Aug. 2012. .
3. Rickards, Herbert. “Capt. Robert Milton Board.” Capt. Robert Milton Board (1837- 1931)-Find a Grave Memorial. Herbert Rickards, 01 June 2002. Web. 23 Aug. 2012. .
4. United States of America. National Archives and Records Administration. Bureau of the Census. Twelfth Census of the United States, 1900. Vol. T623. Washington, DC: NARA, 1900. Print. NARA Microfilm Pub. 5. Rickards, Herbert. “Capt. Robert Milton Board.” Capt. Robert Milton Board (1837- 1931)-Find a Grave Memorial. Herbert Rickards, 01 June 2002. Web. 23 Aug. 2012. .
6. United States of America. National Archives and Records Administration. Bureau of the Census. Twelfth Census of the United States, 1900. Vol. T623. Washington, DC: NARA, 1900. Print. NARA Microfilm Pub. 7. United States of America. Bureau of the Census. Nat’l Archives & Records Administration.Fijieenth Census of the United States, 1930. Vol. T626. Washington, DC, 1930. Print. Microfilm Rolls. 8. United States of America. Bureau of the Census. Nat’l Archives & Records Administration.Fifteenth Census of the United States, 1930. Vol. T626. Washington, DC, 1930. Print. Microfilm Rolls. 9. Collin County Deeds Records; Vol.295, page 589. 11. Collin County Deeds Records; Vol.1299, page 567. 12. Helen G Hal1,Feb 3, 1993, Chairperson, Collin County Historical Society and Charles Hewitt; Interviews with Keister Snodgrass. 14. Collin County Deeds Records: Bk S, page 88.